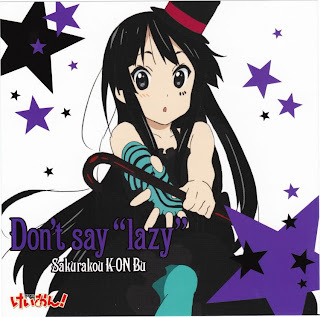 Yesterday I went down to Fabricland to pick up some black satin to make the top hat and ruffles for my Mio cosplay. Picked up one yard of the fabric, which I deemed to be sufficient and it was about $12 with my membership discount. Today, I came home from school and went (almost) straight to work on my teeny top hat. I made use of the same tutorial I used when I made my first mini top hat. It's a very handy little tutorial and I highly recommend it for the millinery challenged. 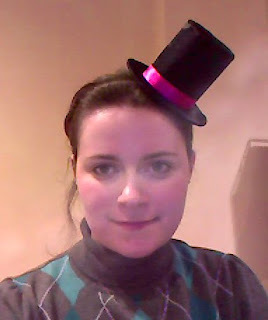 But today, it was definitely a tiny top hat that needed to be made! I did make a few adjustments to the tutorial, in terms of measurements mostly. Nothing drastic, really. The process took from around 3-9 with MANY breaks and an hour long dinner. I was a very lazy costumer today... I really need to work on my discipline. When I was finished I attached it to a little satin covered headband that I picked up from Ardene (which cost about $2). Still on my to-do list is the neck/halter strap and the front ruffles. I figure I can probably get through most of that tomorrow evening. So, things have happened AGAIN! Now I am not going to be Sailor Jupiter for the Halloween party as originally planned. Anyway, now I've decided to dress up as an amalgamation of Mio and Azusa from K-On! Basically Mio from the neck down and Azusa from the neck up. I picked up a very nice dress from the mall on Sunday, in a very rushed and hectic visit (it was about two hours 'til close, which is a little insane for something like dress shopping). But against the odds I did find a pretty nice dress that is more or less the right shape, but will need some extensive altering. Well, not too extensive. But with the time I have left ANY kind of alterations will be extensive. I also picked up something that's perfect for her armband (or will be with some alterations) and I had already bought her tights a few weeks ago. And I will be making some cat ears instead of a mini top hat, mostly because the top hat probably won't fit on my head with the pigtails. 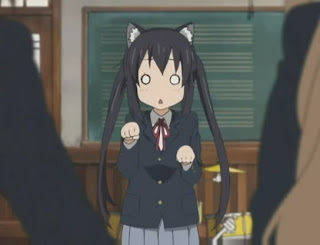 So basically, dressing up as Azusa cosplaying as Mio from the show's end sequence. Tomorrow night I'm going to fabricland to pick up some satin for ruffles and a halter strap. As well as some fur bits to make some cute ears. I'll make the best of all the insanity that's happening this October. Somehow. First, we went to Deserres to pick the FW ink. Their website said they had grey, but the store had none in stock. So we decided to just get black and white ink and mix them. The ink is very mixable, which makes it very optimal for fine-tuning a custom colour. Luckily, black and white are the best colours for lightening and darkening colours, so the next time I dye something I'll already have those colours handy. I decided to go for the more concentrated dye method, that is, 6 drops of ink to a 1/2 cup of 70% rubbing alcohol (for reference: the less concentrated method is 8 drops of ink to 1 cup 70% rubbing alcohol). We used two batches, mixed separately, in a spray bottle. The spray bottle I picked up from the dollar store. I set up a little wig dyeing station in my bathtub to do this, as I heard that the dye can and will stain everything in sight. I put a folding table in the bathtub, covered it with a garbage bag, and then covered the wall behind the wig with a garbage bag as well. I taped the two together so none of the dye would drip/fall down between the wall and table and stain the tub. I pinned the wig on a Styrofoam head and the head on an empty (but sturdy) wine bottle. I can't really say how long the actual spray dyeing process took, because I didn't really time myself. But I just went lightly slowly spraying the top layers and then after lifting the hairs up to spray underneath. I very, very lightly blow dried the ends when the dyeing was done to prevent some of the runoff. I then let it sit overnight to dry. And the next morning I followed the instructions to rinse it out in cold water and let it drip dry. First of all, I didn't do a very good job of getting a before picture in the same lighting, etc. So, I actually don't have a very good basis of comparison. The wig was a very light blond/beige to begin with, and some of that still shines through. It does look grey though. I'm not sure how grey it will look under real sunlight, because the dye came out as more of a tint than an actual drastically changed colour. And we didn't want it to be a drastically changed colour, because that would mean we used way too much dye. So, there is a bit of a challenge for me to say exactly how well this all worked. Another thing is, online tutorials mentioned there would be a need to comb through crispy hair before the cold water bath. Well, the hair wasn't crispy at all... so, does that mean I should have used more layers? I'm not sure. Overall, the colour appears to be what we wanted. I'm not sure how big of a change it is from the original, but we're all satisfied, so it doesn't really matter. I will be using this method again, I found it to be quick, easy and very entertaining. However, next time I'd like to use a white wig and dye it a more vibrant colour, to get a better impression of how many layers are necessary for this method. I absolutely adore the feeling of the black wig, it's so smooth and silky and awesome. The blond wig is pretty awesome too, but it sheds a surprising amount, so hopefully it will be able to survive all the surgery that I will need to do to it. Today went scouring Deserres for wig dyeing materials. Eventually we found the brands we were looking for but not after a lot of headaches looking around in the wrong sections. Anyway, after determining there are no grey sharpies to be found in a 50 mile radius, we decided to go with the FW ink dyeing method (this is for the short blond wig). A further detailed report about my experience to come. The weather was kind to me on Sunday morning and managed to stay dry while I had my Sailor Jupiter photoshoot. Nothing like running around in a skimpy costume at 8:00AM on a Sunday morning to attract unecessary looks. Heh. October dress deadline is now gone with the wind. I technically no longer need this dress before May 2010. That really does make one's determination falter a little. I no longer need to break my back night and day to finish this dress in time. However, I am still going to attempt to finish it so that I can get a few pictures of it into my portfolio before I send that off with my school application. Sigh. Made a few minor alterations on the skirt part of the top layer, then sewed and pressed. All seems to be going well there, thankfully. I then sewed the top fabric and the lining together, and despite earlier trepidation, it went quite well! In other costume news I'm going to do a photoshoot for my Sailor Jupiter costume this weekend, weather pending. At this point Sunday looks clear, so fingers crossed. I need to get it done before it's so cold outside I get hypothermia in my eeny-weeny little skirt.